Members of the Gessow family celebrated the legacy of Alfred Gessow at the 25th anniversary of the Gessow Rotorcraft Center named in his honor in November 2007. 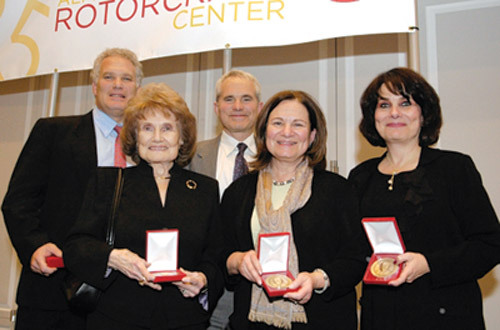 Pictured with the Alfred Gessow Medal, which recognizes significant contributions in rotorcraft, are, from back left, sons Jory and Jody Gessow, Elaine Gessow (front left) and daughters Laura Goldman and Lisa Michelson. Elaine Silverman Gessow, wife of Professor Alfred Gessow, a pioneer in the helicopter field and former chair of the University of Maryland’s Department of Aerospace Engineering, passed away peacefully on January 2, 2014, surrounded by family and friends. She was 88. Born in Baltimore, Maryland in 1925, Mrs. Gessow was the only child of Jack David and Jean Silverman. She was raised in Newport News, Virginia where she worked in her parents clothing stores everyday after school. After high school, Mrs. Gessow went to college when few women from her small town did. After graduating from Madison College with a Bachelors Degree in Education, Mrs. Gessow returned to Newport News where she taught most grades in the elementary school. Mrs. Gessow met the love of her life, Alfred Gessow, a young aeronautical engineer from New York, while working at the Langley Research Center of the National Advisory Committee on Aeronautics (the predecessor to NASA). They were married in 1947. When they started their family, Mrs. Gessow retired from teaching to stay home with their children. An active volunteer and leader in many civic organizations, Mrs. Gessow organized talent shows, fundraisers, Madison alumni programs, taught Sunday School at her synagogue, started a Jewish summer day camp for children, and was president of the local Hadassah chapter and her synagogue Sisterhood. While her youngest two children were still toddlers, Mrs. Gessow returned to school and obtained a Masters Degree in Education from the College of William and Mary, commuting to her classes in Williamsburg, Virginia. After her family’s move to the Washington, D.C. area in 1959, Mrs. Gessow received a further advanced degree in Education from the University of Maryland, where she worked as a counselor. While raising their four children, Mrs. Gessow continued her community service activities. She was a dedicated volunteer for many years at WTOP’s Call for Action in Washington, D.C., a consumer advocacy group, training all of their volunteers. She was a longtime volunteer at Suburban Hospital in Bethesda, Maryland and a CASA volunteer. At her synagogue, Mrs. Gessow served on the Board of Education, chairing the Committee several times, and started the synagogue outreach program to college students, which later developed into the College Connection Committee. In 1980, her husband, Professor Alfred Gessow, became chair of the Department of Aerospace Engineering at the University of Maryland. He served in this post for the next eight years, expanding the department’s research and education activities in rotorcraft, composite structures, hypersonics and space system design. In 1981, Professor Gessow founded the university’s Center for Rotorcraft Education and Research and was its director until 1992 when he took emeritus status. The center, renamed in his honor in 1997, is one of the nation’s leading institutions of rotorcraft research and education. When her husband passed away in May 2002 after 54 wonderful years of married life, Mrs. Gessow added new activities to her agenda and was co-president of a widow and widowers social group in Washington, D.C. She later moved to Birmingham to be closer to her daughter Lisa Michelson and her husband Dr. Marc Michelson and their daughters Jennifer and Courtney. Mrs. Gessow was artistically talented and cultivated many interests. From the international trips she took with Professor Gessow and from their periods living abroad, Mrs. Gessow was an incredible cook, combining ethnic cuisine with Kosher Jewish recipes. An avid gardener, Mrs. Gessow planted flowers every season, making beautiful floral arrangements for the house. Mrs. Gessow loved to cross-stitch, embroider, and knit baby clothes and college blankets for her children and grandchildren. Mrs. Gessow loved to dance, sing, and paint. Mrs. Gessow, or Mama Elaine as she was affectionately called, was defined by her vivaciousness, self-confidence, cheerful disposition, zest for life, and positive attitude. Mrs. Gessow impacted the lives of those around her by her selfless acts of kindness, her generous heart, and her sage advice and counsel. Mrs. Gessow is survived by her children, Lisa Michelson (Dr. Marc) of Birmingham, Miles Jory Gessow (Lisa) of Oakland, California, Andrew Jody S. Gessow (Rhonda) of Woodside, California, and Laura Goldman (Dr. Yale) of Merion, Pennsylvania; grandchildren, Dr. Jennifer Michelson, Courtney Michelson, Samuel Gessow, Jeremy Gessow, Danielle Gessow, Julie Gessow, Dr. Jason Goldman, and Dr. Roger Goldman; three great grandchildren; and her special niece and nephew Marsha and Bill Rademacher of Urbana, Maryland. Read her complete obituary here.